At Olivet, you don’t have to be a music major to join in the musical fun! Instrumental or vocal, large and small, classical, jazz, opera, gospel — you’ll find it all here. Joining an ensemble is a great way to express your gifts and talents and make some new friends along the way! 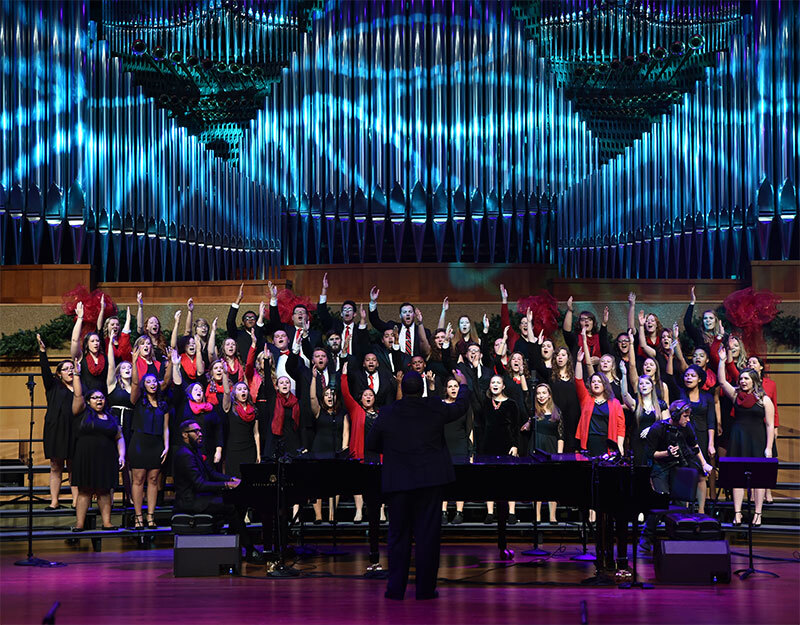 More than 500 students participate in Olivet ensembles each year. And, while some groups require an audition for placement, others have open enrollment each fall. Proclamation Gospel Choir is a 60-voice ensemble who perform traditional and contemporary gospel music, accompanied by a rhythm ensemble. The ensemble performs under the direction of Dr. Marvin Jones. Members are placed by audition and are expected to tour several times throughout the semester. This high-energy group has performed around the Midwest, at Disney World in Orlando, Fla., and at the General Assembly of the Church of the Nazarene in Indianapolis. 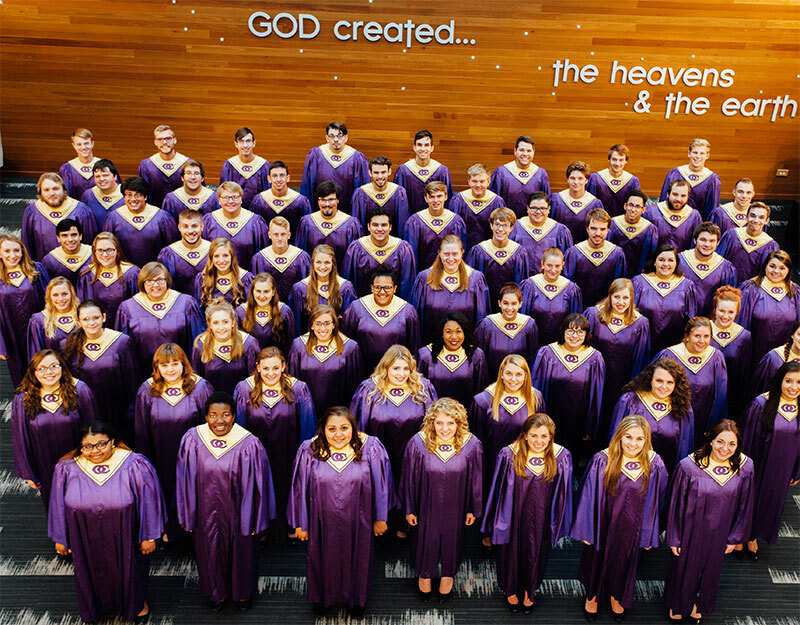 Orpheus Choir, now in its eighth decade of annual performances, represents Olivet in concerts throughout the Midwest, and tours internationally every other year. The repertoire of this select group of singers includes anthems, hymns, spirituals and contemporary compositions, representing different styles and periods of choral music, under the direction of Dr. Jeff Bell. Auditions for this highly-selective choir are held at the beginning of fall Semester, usually the Monday and Tuesday before the first day of classes. Once accepted into the choir, students are not required to re-audition. Though auditions are required, students do not need to prepare a piece. The audition consists of a brief sight-reading section. Concert Singers is a select ensemble of mixed voices. It performs a wide variety of choral literature, from madrigals to jazz, chamber pieces to choral-orchestral masterworks, and sacred selections. Primarily comprised of students majoring in music, membership is open to all students, and is by audition only. 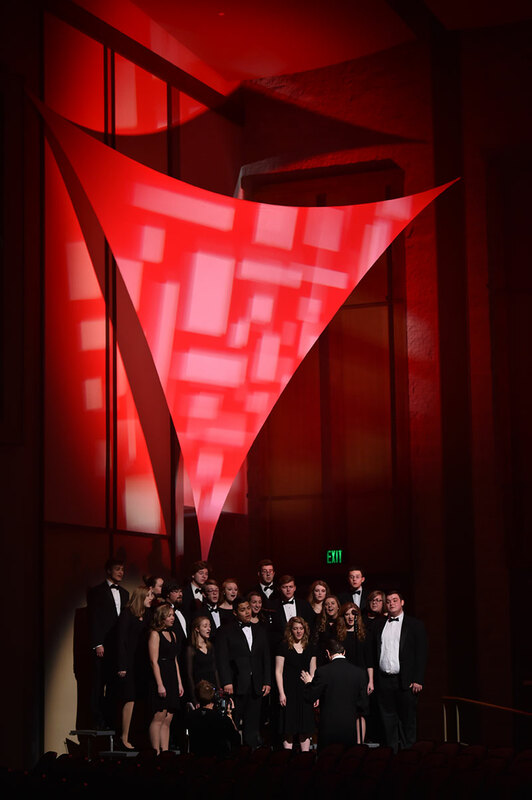 Concert Singers presents campus concerts, as well as touring regionally and internationally. Concert Singers is led by Dr. Neal Woodruff. Auditions are held at the beginning of the fall semester, the Monday and Tuesday before the first day of class. All student members must re-audition for the ensemble yearly. Audition requirements include a prepared selection, sight reading, range exercises and language excerpts. Concert Singers meets three times during the week (check course schedule for days and times). The ensemble tours regionally one or two weekends per semester, and internationally every other year. Concert Singers is a selective ensemble and performs a large volume of literature throughout the semester, so students are expected to work on music outside of class on a consistent basis. Members of the University Orchestra and University Strings are selected, upon audition, from those students pursuing any major or concentration. Auditions are held the Monday and Tuesday before the first day of class, consist of sight-reading and a short, prepared piece, such as an etude. String players who are selected are eligible for the $2,500 participation scholarship. Under the baton of Dr. Neal Woodruff, the Orchestra performs chamber and full symphonic literature. In addition to campus concerts, annual performances of Handel’s “Messiah” and collaboration with student soloists for the Commencement Concert, the Orchestra serves as the orchestra for spring musicals and operas and travels on tour throughout the U.S.
During the spring semester, the Concert Band performs concerts on campus and on tour throughout the Midwest. 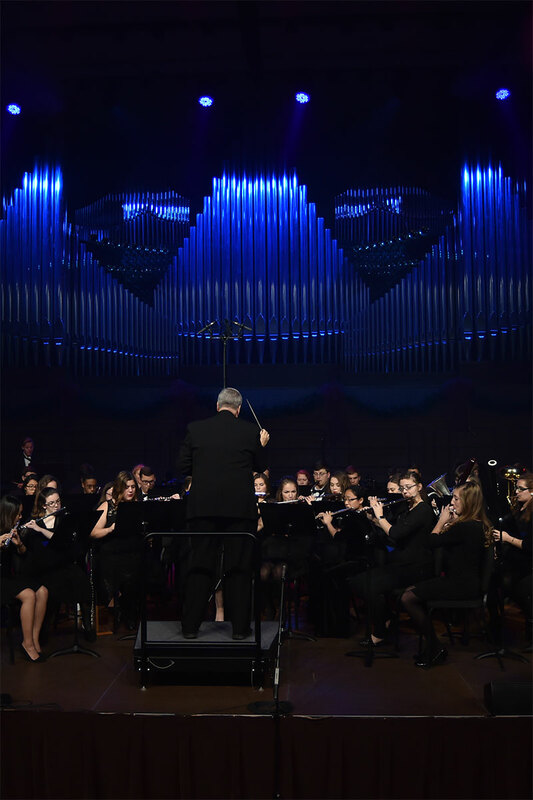 Concert Band consists of the Wind Ensemble, directed by Dr. Neal McMullian, Concert Band, directed by Professor Jerry Luzeniecki, and Symphonic Band, directed by Dr. Matthew Stratton. Students who wish to join for the Concert Band season only may join in November or at the beginning of the spring semester. Placement audition requirements include a prepared solo and sight reading. 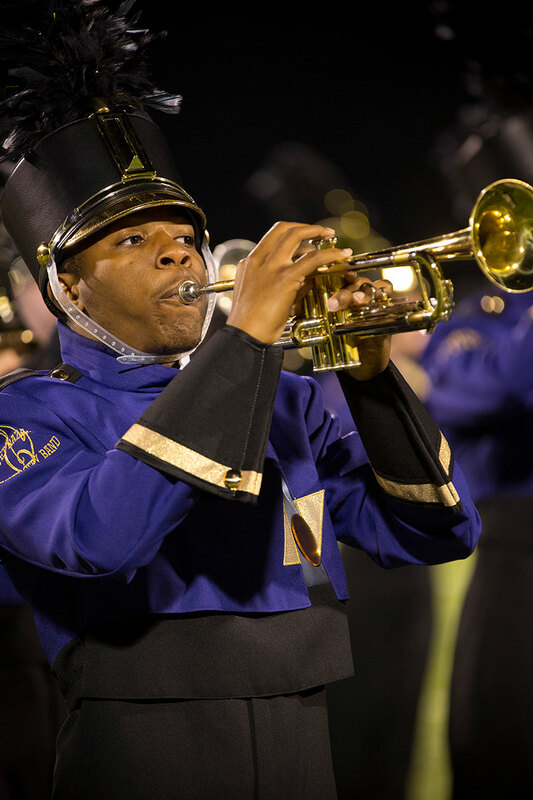 During the fall semester, the Tiger Marching Band performs at home football games, parades, and marching exhibitions. The corps-style band performs a wide variety of music, from popular music to movie themes. Marching Band is under the direction of Dr. Matthew Stratton. There are no auditions held for joining Marching Band. Students who join Marching Band are expected to remain in Concert Band through the end of the spring semester in order to be eligible for the $2500 participation scholarship. Students who are also in Marching Band are not required to re-audition each year but will do placement auditions in Concert Band. Audition requirements include a prepared solo and sight reading. The ONU Jazz Band consists of the traditional jazz instrumentation: saxophones, trumpets, trombones, and a rhythm section. The band presents a wide array of music, from jazz versions of popular gospel numbers to traditional swing favorites, under the direction of Dr. Matthew Stratton. Auditions are held at the beginning of the fall semester. Those who audition are expected to remain in Jazz Band for the full year. Auditions include range exercises, sight reading, and improvisation. All members are required to audition for Jazz Band each year. The School of Music at Olivet Nazarene University is home to several chamber ensembles. These ensembles are largely faculty-led and receive coaching on a weekly basis from their director. Placement in each chamber ensemble is by audition. All auditions take place the Monday and Tuesday before the first day of classes in August. Though groups vary year-to-year, ensembles may include: Brass Quintet, Guitar Choir, Flute Choir, Handbells, Harp Quartet, Horn Quartet, Jazz Combo, Percussion Ensemble, Saxophone Ensemble, String Quartet, and Wind Quintet.